- Page 7 - Vista Casas Real Estate S.L. New Build Apartments situated only 900 mtrs to the beautiful sandy beach, and only 20 minutes drive from Alicante airport! These Modern style 2 bedrooms, 2 bathrooms new apartments come with terrace and underground double parking space included in the price. Communal pool. 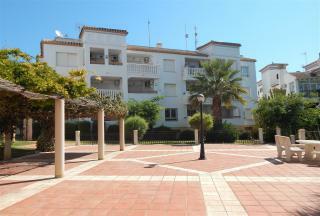 Now Sold Beautiful top floor 2 bedrooms, 2 bathrooms apartment overlooking the communal pool and golf course at the Villamartin Plaza. Underground parking space and storeroom included in the price. The private terrace enjoys lots of sun and a stunning view plus there is a huge communal roof solarium with far reaching views. Lovely 3 Bedroom Battenburg Townhouse consisting of a spacious front garden and terrace, a large lounge/dining room, American style kitchen that leads out onto the back terrace with a utility room. The property has direct access into the communal pool/garden area. On the first floor you will find 2 double bedrooms with fitted wardrobes and both having balconies and a family shared bathroom. (NOW SOLD) Priced to Sell - This Lola bungalow is south facing with 2 bedrooms, 2 bathrooms all on one level. The property has a lovely front terrace, roof solarium and small rear garden. With gated off road parking, communal pool and a short walk to local amenities it makes this property an ideal holiday home. The bungalow comes furnished to a good standard and is ready to move into... Be quick!! !, contact us today to make an appointment to view. The Playa Marina 2 Apartment complex is situated in the heart of the Cabo Roig Strip which is famous for its close proximity to Blue Flag Beaches ,which are just 5 minutes walk from the apartment.The Property is located on the top floor,it comprises of a spacious lounge/dinning area leading out on to a balcony with stairs to a large private solarium, an American style kitchen ,two bedrooms and a family bathroom. There is an underground parking space. 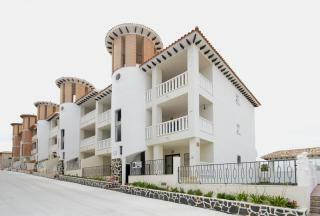 A well presented 2 bedrooms, 2 bathrooms Penthouse apartment located in Las Violetas. 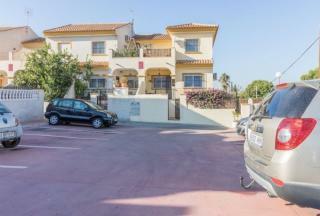 The property offers great distant sea views and has use of a fantasitic communal pool, communal roof solarium and is only a minutes walk to the Villamartin Plaza. 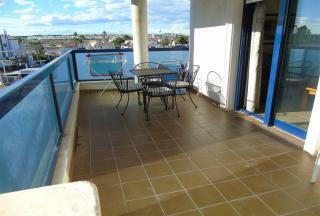 With spacious living area these are popular properties for holiday or permanent use. 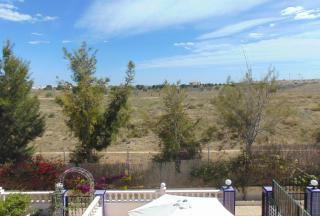 (Reduced by 5,000 euro) A well presented 2 bedroom 2 bathroom Azucena model quad house situated in Villamartin. This property is in very good condition and sold fully furnished. Large lounge/diner, American style fully fitted kitchen that has been fully modernised, two double bedrooms both with fitted wardrobes, a terrace from the master bedroom, large bathroom with bath and shower plus separate toilet downstairs. Large private solarium with good open views, porch terrace from the lounge leading to a large patio/garden of approx 80mÂ² with driveway for off road parking plus lovely communal swimming pool area. 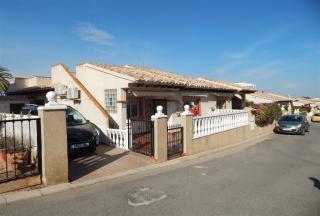 (Sold within 1 Month) Stunning 2 bedrooms, 2 bathrooms south facing bungalow located in Villamartin, on the popular urbanisation of Pinada Golf 1. The property comes fully furnished with air conditioning throughout, built in wardrobes, fully fitted kitchen, community Satalite TV. The bungalow has off road parking for 2 cars, 4 storage sheds, large front terrace and private roof solarium. Situated along a small private road with the communal pool located at the bottom. 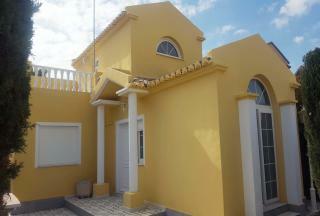 Beautiful villa situated in Torrealmendros. It is on a private urbanization with private security and great communal areas inc swimming pool, green areas, indoor play area, tennis court, soccer and basketball. Just 2 km from the beach and 500 metres from the supermarkets Carrefour and Mercadona, Habaneras shopping centre, schools, institutes, etc. 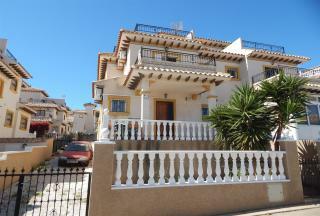 (REDUCED BY 9,500 euro) Stunning Duplex house in walking distance to all services. The house has 3 large double bedrooms (one of them on the ground floor), all with fitted wardrobes and air conditioning in each of them, a large living room. There are two bathrooms and a separate kitchen with plenty of storage space with a large separate gallery. On the upper floor you will find a private solarium-style terrace. On the outside you will find a completely fenced yard, an entertainment area and a barbecue, perfect spaces to spend a night with family and friends, relax or watch the children venture and explore.